The BAKFlip HD is the upgrade to the G2 aluminum series, with superior UV protection that won’t fade or chalk. Heavy-duty aluminum panels have been enhanced with premium density foam core for an increased weight rating up to 400 lbs. Latch housing hardware have been upgraded for durability and long-term use. 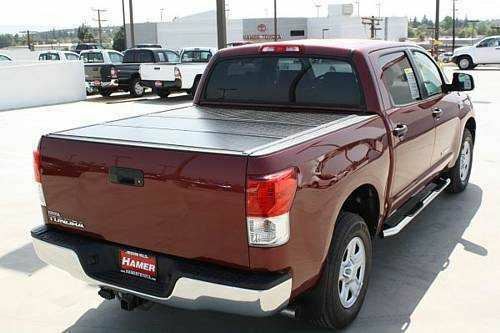 This heavy-duty, all-season tonneau cover is designed to perform in the most extreme conditions. The HD’s resilient infrastructure is designed for every day use, with upgraded components that provide enhanced resistance to the elements without compromising its sleek, low-profile look and feel. The HD’s solid and robust design is flush mount, and backed by an extended 2-year warranty. The HD is widely available for most models of Chevy, GMC, Dodge, Ford, Honda, Nissan, Toyota, Mazda, Isuzu, Mitsubishi and VW pickup trucks. Feel free to browse through the BakFlip HD products and select one that's right for you.